Lovely illustration and expressions! Great work! This is adorable and the colors are lovely. so great piece of work!!! i love your style!! This is so great! you make it look so easy! Really love the girl's expression and you cat is so cool! love this! the expression on the cat is awesome! A simple but beautiful illustration. brilliant work! so fresh and funny. Love the cat's facial expression! Super cool stuff. This illustration has the same feel to it as that extra thing on the Ratatouille DVD. The one that talks about the history of rats and then they sing a song. You know what I'm talking about? Anyways, really nice work guys. 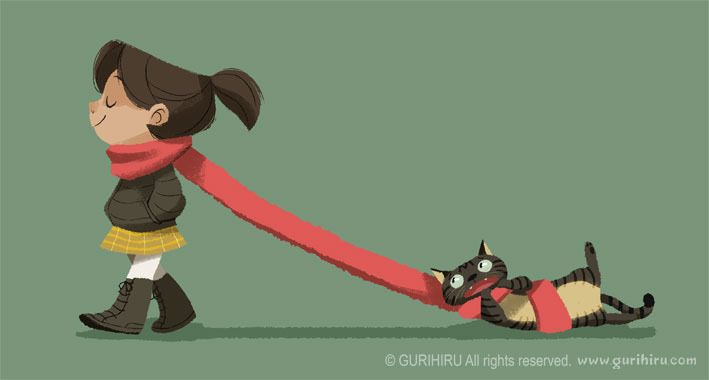 I adore this illo ! It's cute and funny. You're very talented ! Wow. Thank you so much everyone!! I'm glad you like my artwork. Hihi...purrfect! I love that she doesn't seem to have noticed.